Husband of Annie Dorothea Schroeder Schmaedeke, married January 18, 1893. Father of Rose W. Hack (Asa James Dunlap) and an infant daughter who died at birth. Carl Hack and daughter, Miss Rose miraculously escaped instant death, Monday morning, when their automobile collided with an interurban car at Twelfth and Halstead streets, Chicago Heights. As it is both are in the Chicago Heights hospital in a precarious condition – Carl with four broken ribs and a bad gash on the forehead, and Miss Rosie with a badly injured back and other bruises. Mr. Hack had been to his tenement house, about a block and a half from where the accident occurred, and was returning west to come to Beecher. The interurban was approaching from the south, but was not seen until it was right upon them. The electric car must have struck the automobile with terrific force as it dragged the machine and occupants 156 feet from the crossing before it was brought to a standstill. 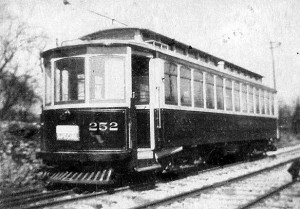 The interurban also must have been going at a high speed, as the track at this point is up grade. When the car was stopped, it was found that the automobile was wholly demolished, and it was at first thought that the occupants had been instantly killed. Miss Rosie was first discovered in an unconscious condition, doubled up and blood flowing from her mouth. Mr. Hack was found immediately after, also in an unconscious condition, badly bruised. They were taken to the Chicago Heights hospital, where it was discovered both were very seriously injured, and the Beecher relatives were at once notified and several have been up to see them at the hospital. Mr. Hack’s injuries include four ribs broken near the spine and one lung badly bruised, and a bad gash above one eye, which had let the eye come out of the socket, but was replaced and sewed up; also other bruises about the body. Miss Hack was badly bruised on the back and kidneys and also has numerous bruises about the body. The condition of both patients is still critical. Mr. Hack’s case is more so from the fact that one lung has been bruised and he is in danger of pneumonia. Reports up to the time of going to press, however, favor both. Mr. Hack was resting much easier yesterday (Thursday) morning, while Miss Rosie partook of a hearty breakfast. That both are not killed in the accident is nothing less than a miracle. The machine was totally demolished and the occupants being dragged the great distance before the car was stopped, it can hardly seem possible that they could be picked up alive. The many friends of Mr. and Miss Hack wish them a speedy and complete recovery. 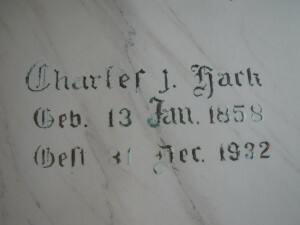 The departed, Charles J. Hack, was born in Hohenfiecheln, Mecklenburg, Germany, January 13, 1858. In the month of August 1864, his parents, John & Sophie Hack, immigrated to this country, locating in Washington Township, east of Beecher. Here young Charles was given opportunity to attend St. John’s parochial school, where he also received his religious education and was later confirmed in St. John’s Church by Rev. G. Koch. On January 18, 1893, he was married to miss Anna Schroeder of near Beecher. This ideal union of hearts was blessed with one daughter, Rosie, now Mrs. Asa Dunlap. Being an expert well driller, he followed this occupation successfully for more than 20 years. In the fall of 1914 the family left Beecher and moved to Chicago Heights, where but a short time later the husband and daughter were plunged into deep grief and sorrow by the death of a devoted wife and loving mother. While in Chicago Heights both father and daughter were brought to death’s door by a serious accident. However, they both miraculously recovered and when later his daughter, Miss Rosie, entered into holy wedlock with Mr. Asa Dunlap, the father was lovingly accepted into their home. In 1922 he moved with his children to Hammond, Ind., where about two years ago, he underwent a serious operation form which he apparently fully recovered. Some two months ago he began to fail in health and although no alarm was felt at first, it gradually dawned upon his loved ones that his earthly pilgrimage would soon be at an end. Given the best of medical skill and attention and loving care, especially on the part of his daughter, he peacefully closed his eyes in death. Dec. 31, 1932, at 9:30 a.m. at the age of 74 years, 11 months and 18 days. 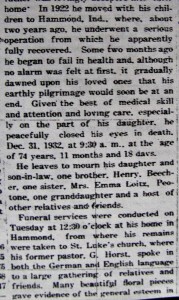 He leaves to mourn his daughter and son-in-law, one brother, Henry, Beecher, one sister, Mrs. Emma Loitz, Peotone, one granddaughter and a host of other relatives and friends. Funeral services were conducted on Tuesday at 12:30 o’clock at his home in Hammond, from where his remains were taken to St. Luke’s Church, where his former pastor G. Horst, spoke in both the German and English language to a large gathering of relatives and friends. Many beautiful floral pieces gave evidence of the general esteem in which Mr. Hack was always held. A niece, Miss Evaline Hack, assistant organist of St. Luke’s functioned at the organ. The following nephews served as pallbearers: Albert Hack, Dr. Edmund Hack, John Hack, Arthur Hack, Irwin Loitz, and Henry Haltenhof. 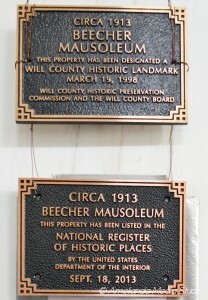 The remains were laid at rest in the Beecher Mausoleum. Although absent from our midst for close to 20 years. Mr. Hack was always considered as one of our own and will long be remembered by his many friends here on account of his many sterling qualities. Having been a charter member of St. Luke’s and for many years an elder of said congregation, the welfare of which was always at his heart, St. Luke’s will always respect and honor his memory. To the bereaved daughter and other loved ones to whom his life meant so much, the community extends its heartfelt sympathy, knowing that the God of love and grace will strengthen and comfort them. While a resident of Beecher, Mr. Hack was often honored with positions of trust, which he capably filled to the fullest satisfaction of the community. For many terms he served on the village board faithfully and loyally and in the same spirit attended to his duties as a citizen of this village. This entry was posted in Automated Burial Listing, Burial Listing, Burial Location, HEADSTONE, Obituaries- Have Full Copy, St. John Evangelical Lutheran Church - Eagle Lake, St. Luke's UCC - Beecher, Village of Beecher board member by Sandra. Bookmark the permalink.